Have you ever tried to loosen corroded screws or large nuts and bolts? This entire workout demands some technicalities as well as basic tools for an efficient operation. This guide is crafted to give you an overview for the two best gadgets: Impact Driver and Impact Wrench. It gets quite tedious to work in tight spaces or among stray pieces that can be troublesome. For the individuals like mechanics or related professionals who need to work in such environment on a regular basis; they have to encounter these issues frequently. That is the reason it is really important to gain some basic knowledge regarding these power tools and gadgets. Which tool is supposed to be used as per the requirements and conditions of environment, what precautions should be taken to ensure a safe use. With this guide you may have a thorough knowledge about the two amazing tools. Let’s dive into the world of gadgets and explore which one is suitable for your needs. Being one of the best drilling tools, an Impact driver comes really handy in a number of professional and non-professional situations. You may easily find Impact Wrench/Driver in many of the industrial, construction or related tasks. On the other hand, these tools are widely used for home based needs as well. But you must be able to distinguish between a Wrench and Driver. Following differences will enable you to decide yourself which tool to be selected in what situations. Torque is a force that helps to rotate nuts, bolts, and other related equipment. Impact wrenches are capable of delivering high torque output with minimal external exertion by the user, by storing energy in a rotating mass, and then delivering it to the output shaft. While the Impact driver delivers a higher amount of torque but not that much as an Impact Wrench does. Size is another dominant factor where both tools vary. You may find Impact wrenches available in the size 3/8″, 1/2″ and 3/4″. However, Impact drivers normally come in the size of 1/4″. With a huge size, Impact wrenches are difficult to be handled. However, impact driver is smaller in size, a one-handed tool and usually cordless. If handling is a critical factor for you, Impact Driver is undoubtedly a smart option for you. Impact wrenches are widely used in the mechanical domain. However, the electrics of the tools can be proficiently utilized for things like shooting timbers or slacking a board onto the side of an establishment. On the other hand, impact drivers are used for screws and the smaller quantities of lag bolts in wood construction. An Impact Wrench itself adjusts the force while being used. Its output torque changes with the duration of the output pulse. While the Impact driver has a speed parameter, where you can increase or decrease the speed as per the requirement of the task you are performing. Impact wrenches are considered as the professional tools. They are used in large scale projects. While the Impact drivers are efficient for simple household activities. Impact wrenches do not provide the downward force and the related additional engagement. Whereas the Impact drivers are famous for producing a great downward force and other related functions. Impact wrench uses compressed air the basic power source. 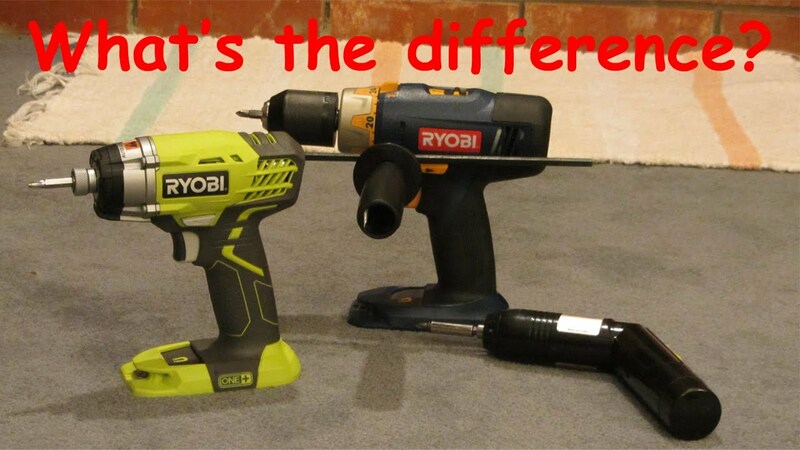 Whereas, the powered impact driver (whether corded or cordless) uses electricity as its basic power source. Note: Impact driver is also available in the manual form. That is also known as ‘Hand Impact Driver’. A hammering force is required in Impact wrenches to fulfill the tasks. But the Impact drivers employ rotational forces to accomplish the goals. Impact wrenches produce enough noise while being operated. And the user is supposed to wear earplugs for additional protection. On the other hand, impact drivers are quite and do not cause any kind of noise during operation. Both of the tools are similar in some respects while having differences as well. Each tool is suitable for particular needs and environment. Keeping in mind these differences, you will be relaxed in making your final selection.